WHEELS: 17" X 7" ALUMINUM, TRANSMISSION: 8-SPEED AUTOMATIC (845RE) (STD), TIRES: P265/70R17 BSW AS (STD), REMOTE KEYLESS ENTRY W/ALL-SECURE, RADIO: UCONNECT 5.0 -inc: 5.0" Touchscreen Display, Overhead Console, GPS Antenna Input, Rear View Mirror w/Microphone, Temperature & Compass Gauge, Integrated Voice Command w/Bluetooth, Charge Only Remote USB Port, POPULAR EQUIPMENT GROUP -inc: Remote Keyless Entry w/All-Secure, Carpet Floor Covering, Front & Rear Floor Mats, SIRIUSXM Satellite Radio (subscription required), For More Info, Call 800-643-2112, No Satellite Coverage w/AK/HI, PARKVIEW REAR BACK-UP CAMERA -inc: Rear View Auto Dim Mirror w/Display, GVWR: 6,800 LBS (STD), ENGINE: 3.6L V6 24V VVT -inc: Flex fuel capable (STD), DIESEL GRAY/BLACK, CLOTH 40/20/40 BENCH SEAT. 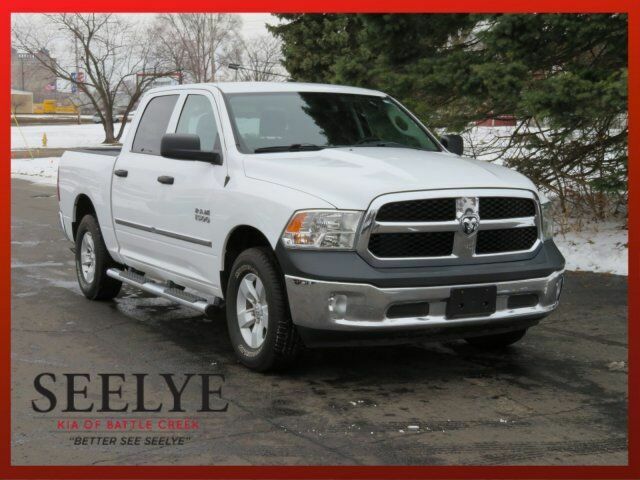 This Ram 1500 has a strong Regular Unleaded V-6 3.6 L/220 engine powering this Automatic transmission. CARPET FLOOR COVERING, BRIGHT WHITE CLEARCOAT, 3.21 REAR AXLE RATIO (STD), Variable Intermittent Wipers, Urethane Gear Shift Knob, Transmission: 8-Speed Automatic (845RE), Transmission w/Driver Selectable Mode and Oil Cooler, Tires: P265/70R17 BSW AS, Tire Specific Low Tire Pressure Warning, Tip Start, Tailgate Rear Cargo Access, Systems Monitor, Storage Tray, Steel Spare Wheel, Spray-In Bed Liner, Single Stainless Steel Exhaust, Side Impact Beams, Short And Long Arm Front Suspension w/Coil Springs, Sentry Key Engine Immobilizer, Regular Box Style.